Each year we are extremely grateful for the talented members who take on the many important roles on various teams that keep our chorus thriving. At our recent AGM we were fortunate to have more nominees volunteer than the number of roles available! 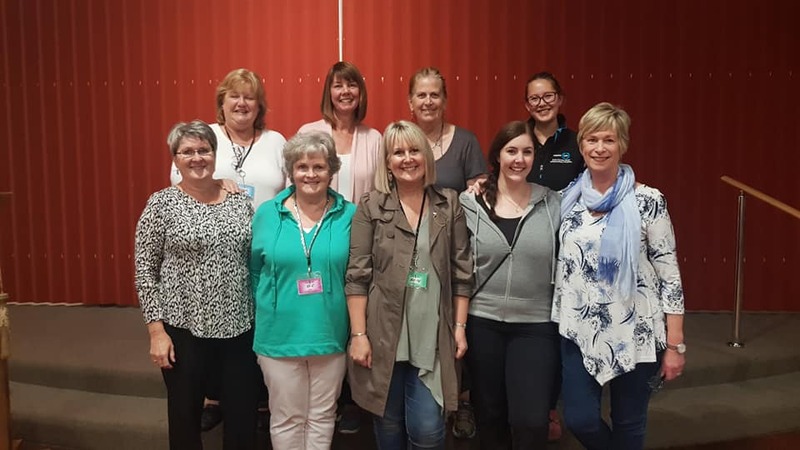 Special thanks go to all new, outgoing & continuing Management Team members..
We're more than a little excited to learn that Vocal Vibes' member Faye Putt has won a regional grant to attend the Sweet Adelines International Directors & Visual Leaders' seminar in Texas this August! Australian chorus choreographers were invited to apply for a single sponsorship to attend “A Brand New Song & Dance” in San Antonio TX, however based on their application content, vision and purpose, two exemplary applicants could not be separated. 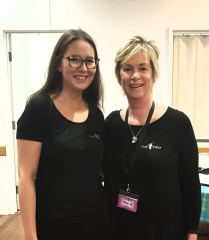 As a result, Faye from Vocal Vibes in Victoria, and Megan from Redland Rhapsody Chorus in Qld, were announced joint winners of the 2019 Region 34 Education Grant. 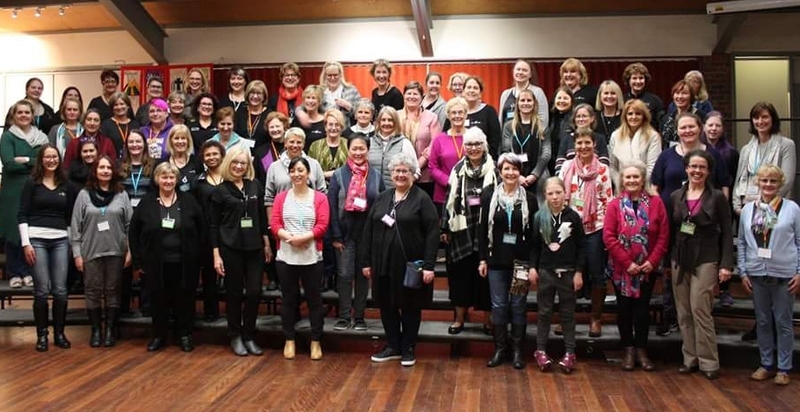 A report of their insights will be published in the following Sweet Adelines Australia publication "Ozchords", and both Faye and Megan will be invited to present at the 2020 Regional Director’s School. VV members are thrilled for our talented and hard-working Choreographer Faye to enjoy this experience and return to us inspired by highly esteemed faculty sharing their passion and new ideas in visual expression and showmanship! 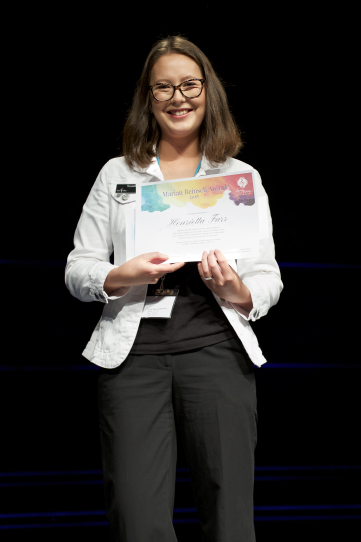 To top off a wonderful convention 2018, our very own Henrietta Farr was presented the 2018 Marian Reinsch Award!! This biennial honour recognises excellence in Director Certification Program (DCP) achievement. We are all so proud of her!! 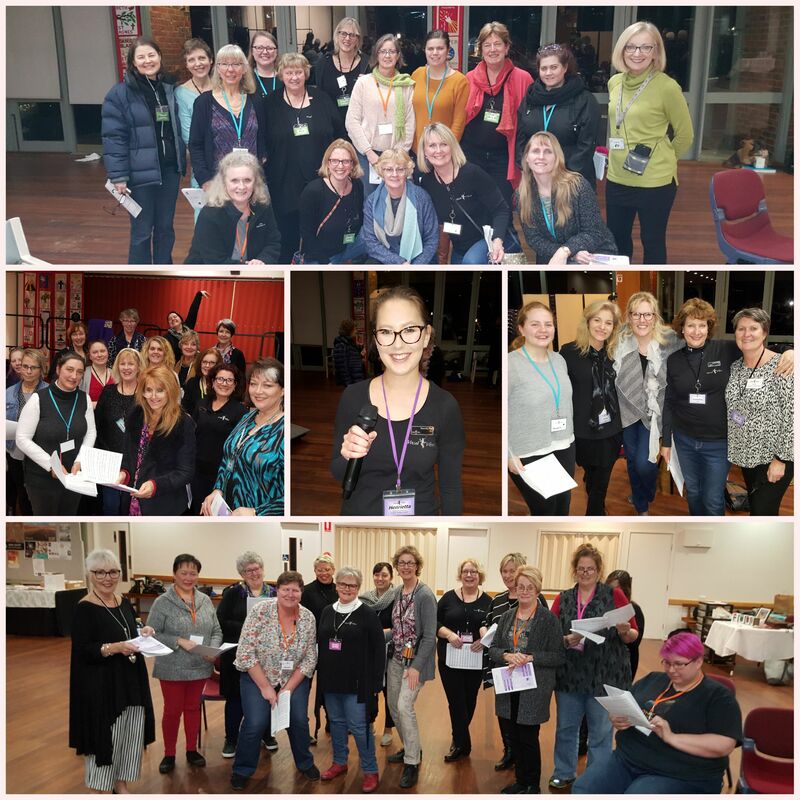 Vocal Vibes Inc. gratefully acknowledges the generous support of the Maroondah Council Community Grants Funding Program, which enabled us to purchase striking new daytime performance tops for each & every member of the chorus. We look forward to showing them off, so keep an eye on this website for news of our next local performance! More than once at convention 2016 our members heard this and it is I suppose quite true: Vocal Vibes is a young chorus in a number of ways. In addition to having a sizable contingent of younger-than-average members, in Wollongong our six-year-old chorus competed for only the third time. It was also our first competition under Jeanette Whitmore, whose superb skills and experience preparing and delivering at competition helped us put out a stronger and more skilled performance than ever before. 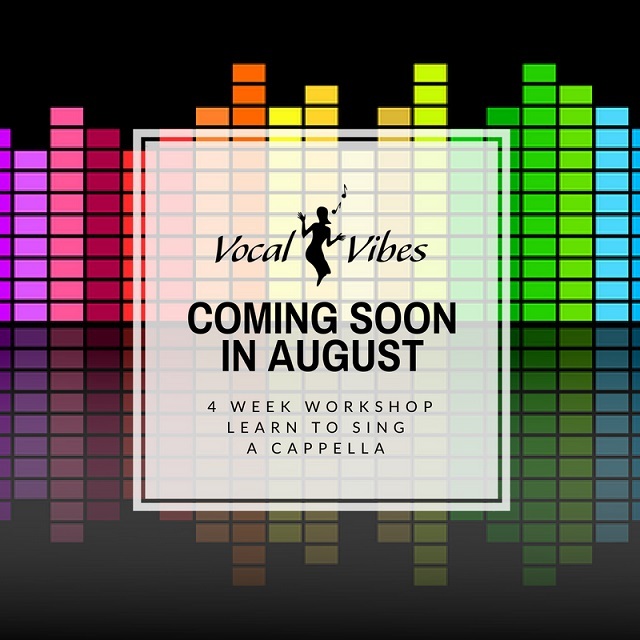 Vocal Vibes is also young because our membership also includes a number of women who are ‘young’ in barbershop: whose journey in the art form is just beginning. We took to convention 8 first timers, meaning that nearly 10% of all first timers at convention belonged to Vocal Vibes. One of these was even at her first ever sing-out ever! Each Vocal Vibes member receives a butterfly pin after her first sing-out, but the butterfly our Akke earned at Wollongong was extra significant and very well deserved. Wollongong was of course a huge experience for every first-timer and they were made to feel very special by both Vocal Vibes and the conference organisers. As well as competing as a chorus, Vocal Vibes was represented in three quartets: Momentum, Platinum and Cha-Ching!, each of whom did us proud. The remaining chorus members watched with a thrill as each foursome took to the stage for the terrifying feat that is Quartet Contest, and the chorus gave its vocal support from the audience. We were so proud of them and they felt the love flow to the very distant stage. When chorus competition day dawned we had the unenviable task of waiting until late afternoon to perform, but much hotel room singing and an inexplicably long and eerily quiet bus ride later, we were suddenly on stage. A heart-rending interpretation of If I Loved You and a sassy, fun Jazz Me Blues later and it was all over. But then it wasn’t: we were thrilled to be selected as one of 2 choruses to participate in the master class with judges Sharon Babb and Dale Syverson. On stage for the second time in 24 hours we nailed our ballad and had fun with our uptune all over again. The two judges’ wealth of experience and knowledge gave us lots of things to add to our toolbox as we continue to grow and develop in barbershop, and as a chorus. 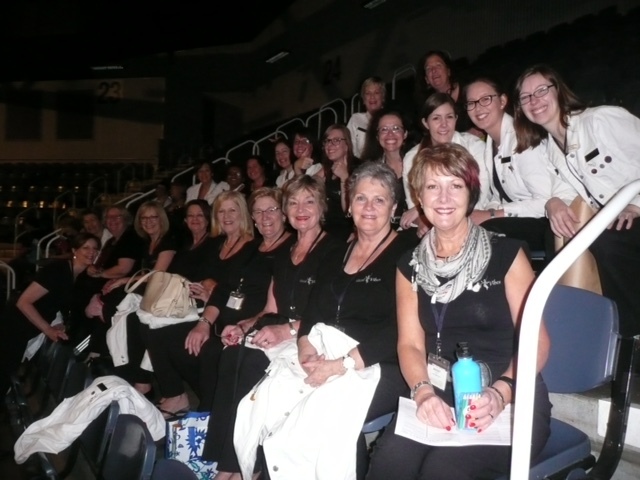 Our fine showing at convention in 2016 was the result of an enormous amount of work by our Director, Section leaders, Music and Management teams, Choreographer and Costumer and their dedicated teams, Convention Liaison, our weekly extra practice group organiser, as well as each individual chorus member and the family and friends that help make it all possible. Vocal Vibes says a huge THANK YOU to them all! Vocal Vibes is very excited to announce the appointment of Jeanette Whitmore as our new director. Jeanette is an accomplished barbershop 'Master Director' - one of only six in Australia to achieve this honourable recognition from Sweet Adelines International. She has already won the hearts of each and every member and her talent and expertise is inspiring Vocal Vibes to take it to the next level. Our 2014 Maroondah Festival performance was Jeanette's first time at the helm of Vocal Vibes. It was a great day with a number of new ladies performing for the first time with us as well. We're looking forward to many more performances and competitions under Jeanette's wonderful direction. We wish to take this opportunity to thank Lorraine Stackpoole, our recently retired director, for her hard work over the past five years getting Vocal Vibes to where we are today. We are very much enjoying having Lorraine now singing on the risers with us. Vocal Vibes are getting into the 'Christmas spirit' with performances at several shopping centres and we would love to see you in the audience! Check out the details at this link. If you can sing and would like to give Vocal Vibes a try, call and come along to a Monday evening rehearsal. 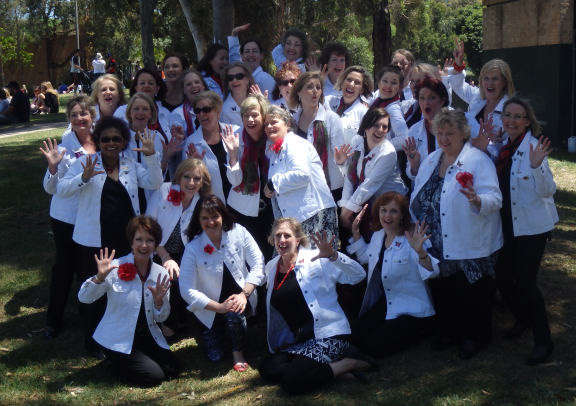 Vocal Vibes Chorus had a fabulous time up in Sydney competing in the annual Sweet Adelines competition. 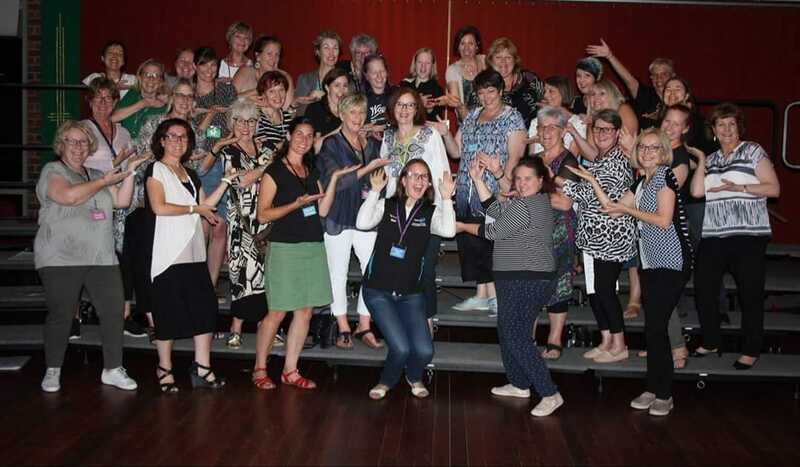 It was the celebration of the 25th Anniversary of Sweet Adelines in Australia and 37 of the almost 50 members of Vocal Vibes Chorus sang and danced up a storm in the competition this year. We scored an amazing 517 points which placed us 10th out of 23 competing choruses from all around Australia. This is very impressive as Vocal Vibes is only 5 years old. Kerry Haddow says, "We are so excited to have done so well this year. All our ladies are very talented and really love singing together. Vocal Vibes have a great future ahead of them. I'm quite addicted to barbershop singing especially with all of these lovely ladies."